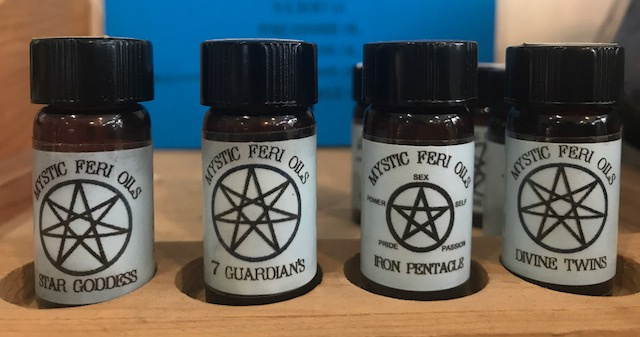 Our Mystic Feri Oils are carefully crafted and charged up with essential oils and absolutes. They were created through direct work within the Anderson Feri Tradition of Witchcraft for initiates, students and seekers who feel a connection with this particular path. We consider them powerful tools used to enhance ones practice. If you are not familiar with the concepts of this tradition, we recommend our Magickal Oils instead. Used for all manner of Feri workings. Specailly crafted with essential oils and absolutes, one for each of each of the 7 Guardians. Each bottle contains a herkimer diamond to hold in the energy. Use to run the energy of the iron pentacle and align & balance the points within ourselves. Our blend contains an essential oil for each of the 5 points. Made in honor of God Herself. Use as a devotional annointing oil for our primal Goddess of the cool vast darkness of infinate space. The Divine Twins are opposites... yet they are the same. They pull in the energy of Above and Below and from their union new things are birthed. They help us to unite seemingly opposing forces within ourselves and accept ourselves in all our parts. This oil may be used in connection with these beings and at times when we are struggling with conflict and wish to process, unite and transform the energy into something that we can use. It may also enhance meditation/reflection on opposing forces in nature and seeking deeper understanding of the mysteries.